Sandwiches & Wraps served with side of House made chips. Only hungry for a half sandwich, salad, or wrap? Pick one below. Hamlet Honey Kissed Ham served with Swiss Cheese, Lettuce, Tomato and Honey Mustard on Toasted Wheat Bread. 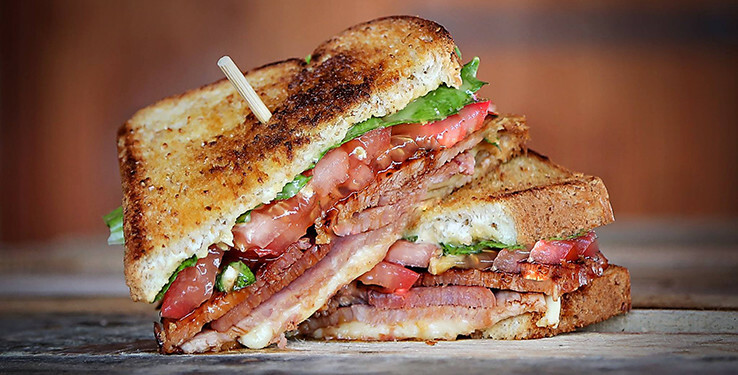 A generous portion of Smoked Applewood Bacon, Lettuce, Tomato, Avocado and Mayonnaise on toasted Artisan White Bread. 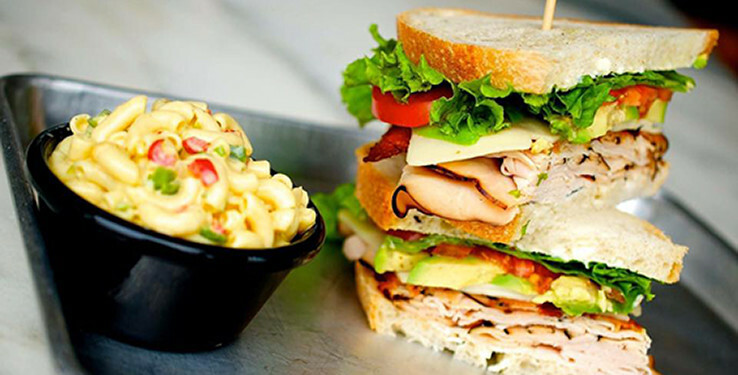 Boar’s Head Turkey with Swiss Cheese, Lettuce, Tomato, Avocado, Mayonnaise and Applewood Bacon on Wheat Bread. 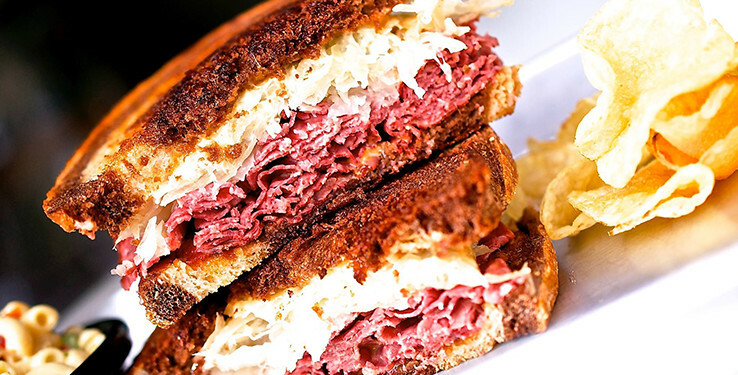 Grilled Boar's Head Corned Beef piled high and topped with Melted Swiss Cheese, Boar's Head Sauerkraut and Savory Ginger Wasabi on Toasted Marble Rye. Your choice of Boar’s Head Roast Beef or EverRoast Chicken Breast simmered in Au Jus, Grilled Onions and Peppers, smothered in Provolone and Smoke Gouda Cheese, Mayo on a toasted Italian Hoagie. Boars Head Curry Chicken Breast, Almonds, Celery, Mayo, Curry Powder. Grilled Chicken Breast, Romaine Lettuce, Caesar Dressing and Parmesan Cheese on Toasted Ciabatta Bread. Savory Chicken infused with Green and Red Apple, Pecans, Celery, Red Onion and Mayonnaise on Wheat Bread. Our renowned blend of Hamlet Ham mixed with Egg, Pickle Relish and Mayonnaise on Artisan White Bread. The Fire: Blazing Buffalo Chicken, Havarti Jalepeño Cheese, Buffalo Mayo. The Ice: Lettuce, Tomato, Pickle and Creamy Blue Cheese Dressing. A Hamlet favorite! Salsalito Turkey Breast, Havarti Jalapeño Cheese, tossed in a Sweet Vidalia Onion Sauce, served up hot with Spicy Mustard on Toasted Jalapeño Bread. Our famous Honey Kissed Ham, slow cooked with Pinto Beans and servied with a side of Cornbread. A half pound of our signature Honey-Kissed Ham, Butter, Sour Cream, Cheese, Bacon, and Chives. Half order of any two items on the menu. Chips are included with two half Sandwiches/Wraps only. Includes a Drink, String Cheese and one side item. Choice of Hot Ham, Turkey or Roast Beef or Cold Ham, Turkey or Roast Beef. Cold Sandwich of your choice served with House Made Chips and Cookie. A variety of 10 cold Sandwiches of your choice.